The Roosevelt Hotel is located at 7000 Hollywood Boulevard in Los Angeles, California and was completed in 1927. This building was designed by Fisher, Lake and Traver and stands 161 feet tall with 12 floors. Many legendary actors resided or rented rooms in the Roosevelt such as Clark Gable and Carole Lombard. They rented out the penthouse frequently and is now named after them. Marilyn Monroe lived there for two years. 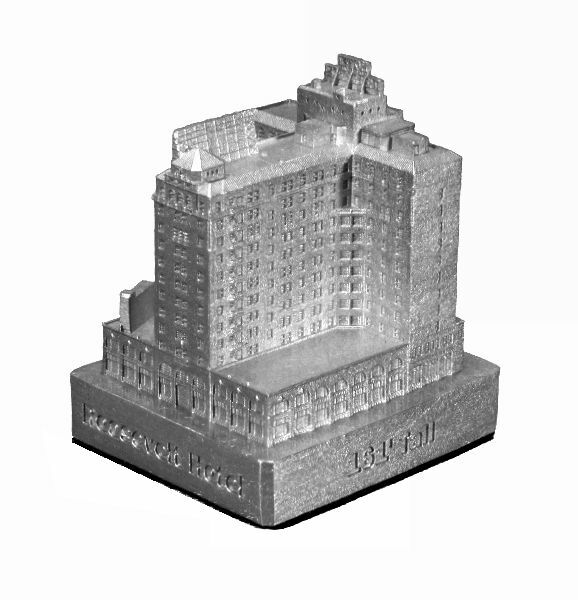 This pewter replica stands 2 inches to the roof and 2-1/8 inches to the top of the hotel sign and is finished in new pewter. This model's scale is 1 inch = 100 feet.